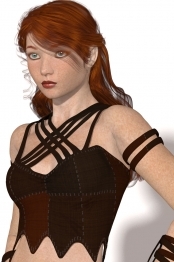 RPublishing’s Elven Desire fit to GND4:Athletic | Alizea3D – the virtual tailor ! This is a set of custom fit morphs for RPublishing’s Sand Heiress to fit GND4:Athletic bodyshape . Included are fits for all the pieces of the outfit , as well as a FootPetite morph for the leggings . The original RPublishing’s Sand Heiress set , available here >>Sand Heiress .